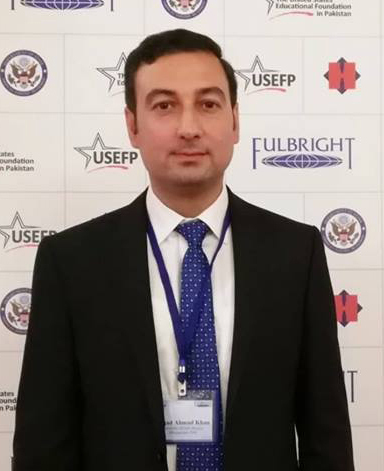 Sajjad Khan, a Pakistan native and Fulbright Scholar, joined The University of New Mexico Nanoscience and Microsystems Engineering program this fall. Khan was inspired to study this area because of his mother. In 2013, doctors found a tumor on his mother’s spinal cord during an MRI scan, a tumor that was assumed to be cancerous. The tumor was found to be non-cancerous after surgery, but this experience gave Khan a new perspective on life, inspiring him find a way to diagnose cancer without extensive surgery. It was this mindset that led Khan to UNM to pursue his Ph.D. in nanoscience and microsystems engineering. Khan is especially interested in how to diagnose cancerous cells in initial stages with nanobiosensors before they metastasize. The Fulbright U.S. student program, introduced by Senator J. William Fulbright in 1945, is the largest U.S. exchange program offering opportunities for students and young professionals to undertake international graduate study, advanced research, university teaching and primary and secondary school teaching worldwide. The Fulbright Program currently awards approximately 1,900 grants annually in all fields of study and operates in more than 140 countries worldwide. Several students from UNM and the School of Engineering have been awarded with this prestigious honor throughout the years.